Many of today’s trainers are from the baby boomer era and many are still using outmoded training methods that have little appeal for the younger generations of learners. 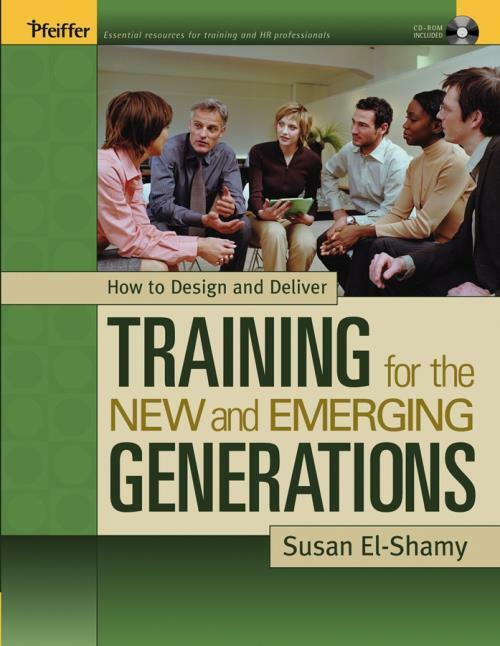 How to Design and Deliver Training for the New and Emerging Generations is written for corporate trainers who may be at a loss on how to effectively reach today’s trainees. The companion CD–ROM offers the book’s games and activities, which can be customized and reproduced. "Stop using training techniques from your grandfather’s time. The new generation won’t fall for your old tricks. Get over it, and get with it. Buy, read, and apply Susan El–Shamy’s practical handbook." "This practical, insightful book belongs on every trainer’s bookshelfnot just as a much–needed guide for designing and delivering training for the emerging generations, but also as a valuable collection of interactive learning exercises for all generations." Part ONE: The Different Needs of Younger Learners. Chapter One: The Boomers and the Generations That Follow. Chapter Two: Training the Different Generations. Chapter Three: Pick Up the Pace to Hold Attention. Chapter Four: Increase Interaction to Engage Learners. Chapter Five: Link to the Learner to Make It Meaningful. Chapter Six: Offer Options for Nonlinear Learning. Chapter Seven: Make It Fun to Keep Them Learning. Chapter Eight: Rattle Your Training Paradigms. Game 2: Word Search Mania. Game 3: One Hundred Ways. Game 4: A Matter of Definition. Game 5: A Change of View. Game 7: Hunt for Examples. Game 9: Walk the Talk. Game 10: Find the Top Ten. Game 11: The Whole Is Greater. Game 12: A Stick by Any Other Name. Game 13: Online Treasure Hunt. Game 15: Q&A Black Jack. Game 16: Approach and Coach. Game 17: Ready, Set, Goal. Game 18: Involve to Solve. Game 19: Across the Board. Game 20: Jelly Bean Art.